Sample preparation procedures account for approximately 85% of the time associated with atomic spectroscopy analysis. 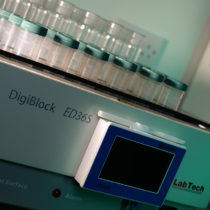 The LabTech DigiBlock can be used for the digestion of samples, evaporation of acid/solvent media, and can be used alone or in conjunction with microwave digestion systems. DigiBlock is accepted and used in many EPA Methods (e.g. 200.2, 200.7, 200.8, 200.9, 245.1, 365.1, 3010a, 3020b, 3050b, and 3060). DigiBlock can use low cost, disposable digestion tubes to speed up and simplify the digestion process. The different size digestion tubes are clean, with no detectable background contaminants and do not require washing with acids prior to use. 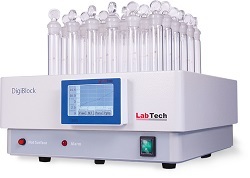 Coupled with reduced energy costs from the DigiBlock heater design, the use of disposable tubes can help reduce laboratory sample preparation costs.